In this Monday, Dec. 3, 2018, photo, a guard tower and barbed wire fences are seen around a facility in the Kunshan Industrial Park in Artux in western China's Xinjiang region. 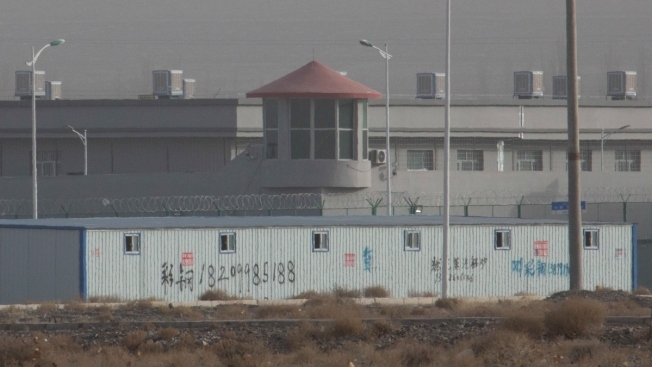 This is one of a growing number of internment camps in the Xinjiang region, where by some estimates 1 million Muslims are detained, forced to give up their language and their religion and subject to political indoctrination. Now, the Chinese government is also forcing some detainees to work in manufacturing and food industries. Some of them are within the internment camps; others are privately owned, state-subsidized factories where detainees are sent once they are released. The U.S. government said Tuesday that it is reviewing reports of forced labor at a Chinese internment camp where ethnic minorities are sewing clothes that have been shipped to the U.S. market.